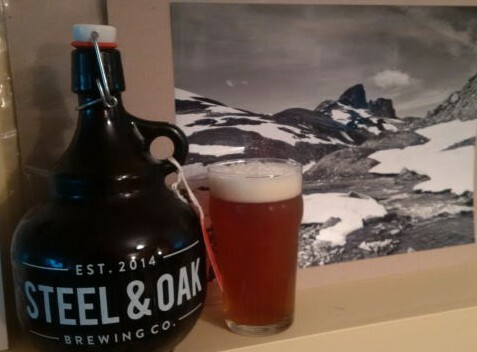 Dry Hopped ESB – Steel & Oak Brewing Co.
From the brand new brewery located in New Westminster Steel & Oak Brewing Co. comes their “Dry Hopped ESB”. The beer pours a cloudy copper colour with a tan head that leave a nice lacing on the glass. The aroma consists of caramel, malts, citrus, floral hops and an overall sweetness. The flavour was of earthy hops bitterness, pine, resin, caramel and some citrus. The alcohol content comes in at 4.6% with an IBU of 40. This may be an Extra Special Bitter but the dry hopping sure shines through. A fan of an IPA will probably really like this beer just like I did.